Some of the earliest structures were Adobe architecture. Adobe is a material made from sand, clay and straw, dung or other fibrous materials. heat very slowly in the winter. The same mixture, without the straw, is used for mortar in placing the dried adobe bricks together to form a structure. Some cultures even figured out they could utilize lime-based cement for the plaster to protect against the wet months. The thickness of the adobe bricks is key in the architecture. It is what essentially keeps the structures cool in the summer and warm in the winter. The largest structure ever erected from Adobe was the Bam Citadel. But it suffered serious damage from an earthquake in 2003. The Huaca del Sol in Peru is another grand adobe structure that was created from over 100 million signed bricks. 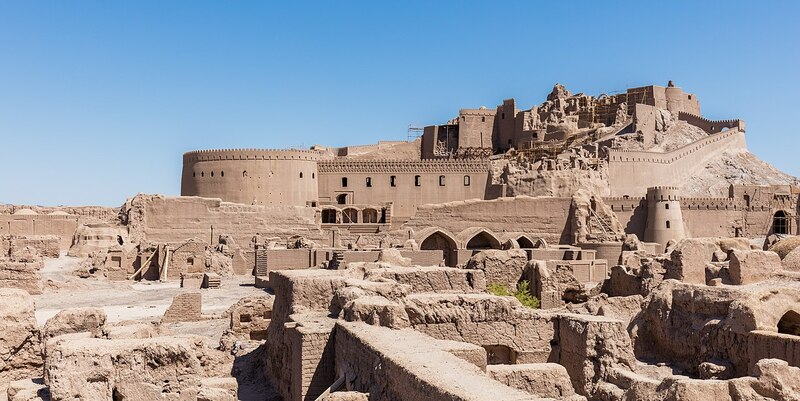 The world’s largest adobe architecture structure is the citadel of Arg-e Bam, erected as late as 500BCE, possibly earlier. The area of Bam Citadel is 180,000 square meters and is surrounded by walls 6-7 meters high and 1815 meters in length, all out of Adobe. When the gates to the city were closed, no human or animal could enter. The city was self-contained with well access, gardens and cattle all within the walls. The adobe architecture was a little different when it came to putting a roof on the structure. Typically roofs were assembled from lengths of wood or metal. Then rows of dried adobe bricks are laid over the top of a support structure and plastered into place with more adobe.